This is to let you know that little Everett is very sick. I have had the doctor three times. He says it's Grippe and sore throat. He says it is not serious. (?) I am very much worried still. I hope it's not so bad. So don't worry, I'll let you know how he comes along. Have a good Xmas. I am well been sick a few days. Hope you are well and enjoy Xmas. Lots of love to all. Your son. 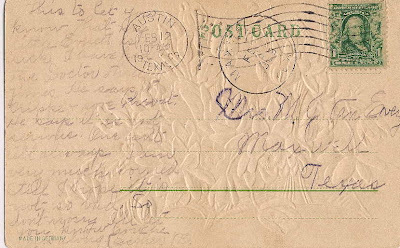 Born in August of 1906, Everett would have only been three years old at the time of these postcards. It appears that Sam had already left his family in Austin, TX and moved to San Francisco. I knew he was there by the 1910 census. 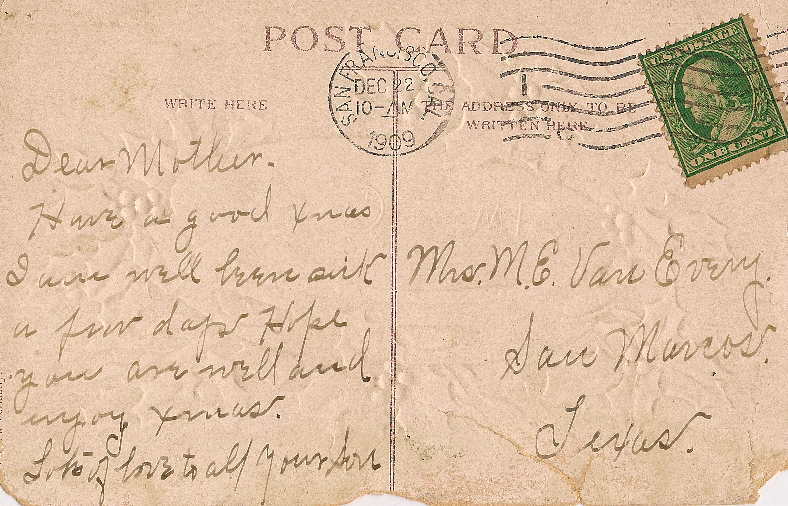 2) These two postcards are in a group of postcards that were all sent to my great grandmother, which she saved. They ended up in the possession of a maternal aunt, who recently sent them to my mother. Most of the others come from my great grandfather's many siblings. 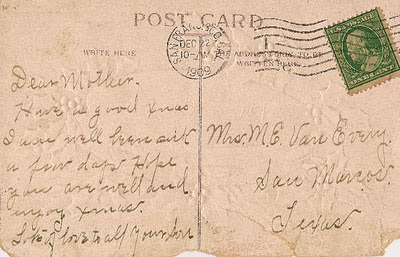 3) I do note that the two postcards weren't sent to the exact same address. Maxwell and San Marcos, Texas are close to each other; Google Maps states a distance of 11 miles between the current towns. I'm not sure of the exact location of the Van Every farm. In 1914 the population of Maxwell was 225. San Marcos probably had a population between 2000-4000. It may be a matter of mail to the small rural towns being delivered to the nearest city anyway. I wonder if the words marked "(?)" in your transcription of the first postcard are "One can't tell always." Thanks! I had a lot of difficulty with the faded writing, but that looks like it works. I'll check the larger scan tonight.